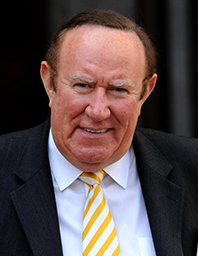 Andrew Neil presents the Daily Politics on BBC Two, the Sunday Politics on BBC One and This Week on BBC One. One of Britain’s best-known and experienced journalists in print and broadcast, he’s been the editor of a national newspaper, publisher of Scotland’s national newspaper and a TV executive. Andrew has an MA (Hons) in Political Science. His first job was in Westminster as a political researcher specialising in Housing Policy for the Heath Government. He moved into journalism in 1973 and never left. During his career he has been UK Editor of the Economist, Editor of the Sunday Times, Executive Chairman of Sky Television and Publisher of the Scotsman Group of newspapers in Edinburgh. He has been a Westminster lobby correspondent, a White House correspondent and a Wall Street editor. Besides presenting five programmes, he is currently chairman of various companies, including The Spectator Magazine Group, ITP Magazines and World Media Rights.